Garlic is one of the easiest and most satisfying crops to plant. You can eat the long, curly scrapes that grow in the spring for some pretty funky and delicious side dishes. Frying garlic scrapes in butter is heavenly. Leave some to flower so that, while it takes energy from the bulb, you get the most delicate of flavors in that special dish. 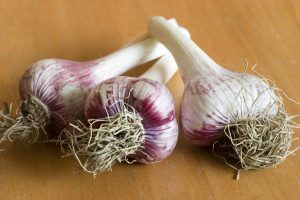 In late June or early July when the scrapes loose their curl and the leaves begin to brown, you can harvest the bulbs for garlic that is so delicious and juicy that you will never eat store-bought again. 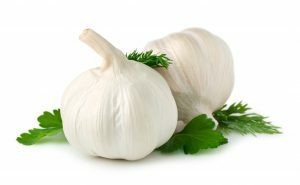 Garlic comes in two varieties–hard neck and soft neck. The hard neck variety has a hard stem and comes in vibrant colors. The cloves are of uniform size and they do better in colder climates. Soft neck varieties have irregular-sized cloves and more flavor, but need a mild winter to thrive. This is the variety you are most likely to find in your local store. While you may be tempted to plant store-bought bulbs that have started growing in your fridge, resist the urge! They have been treated and are unlikely to yield favorable results. Garlic likes light, loose soil which will keep it relatively dry. If you have clay soil, add some sand to avoid rotting bulbs. Once you pop your bulbs into the ground, make sure you compost well and mulch because garlic doesn’t like competition. Be sure to weed regularly. To plant, separate cloves without peeling and plant four inches apart in rows that are 20 inches apart. The pointy side goes up! If you have a mild winter and are planting soft necks, they can go two inches deep. Go down to six inches if you have a harsh winter and don’t forget to mulch. When you reach the dog days of summer and the leaves brown, dig up one to see if the cloves are plump and ready for harvest. Don’t leave them too long or the bulbs will separate. Pull them up or dig gently to free them. Dust off the soil, trim off the leaves and roots and hang in a dry, cool place for four to six weeks. Store in a dry, cool place. Avoid storing them in the fridge or they will sprout.